If you had to define your style in one word, what would it be? Edgy? Classy? Feminine? Tricky, isn’t it? For me, it most definitely is. I can’t give you just one word to define my style. In the summer, it’s an array of floral prints, multiple shades of lace, all tied into a feminine look. However, during the fall and winter, I definitely add an edgy vibe to my look. This winter, I’ll finally admit it. I own more black in my closet than I ever thought possible. I’ve caved. The trick is, that I combine a few different styles and textures to my look, and it doesn’t appear to be solid black. Over the weekend we spent some time, wandering around the city and brunching with friends. For my look of the day, I found a black and silver lace mini skirt (similar here), and I fell in love. It happened to fit perfectly and it became my statement piece for the day, therefore I built my style around it. To compliment the silver lace in the skirt, I added a shimmering silver turtleneck (similar here), which I tucked into the skirt. 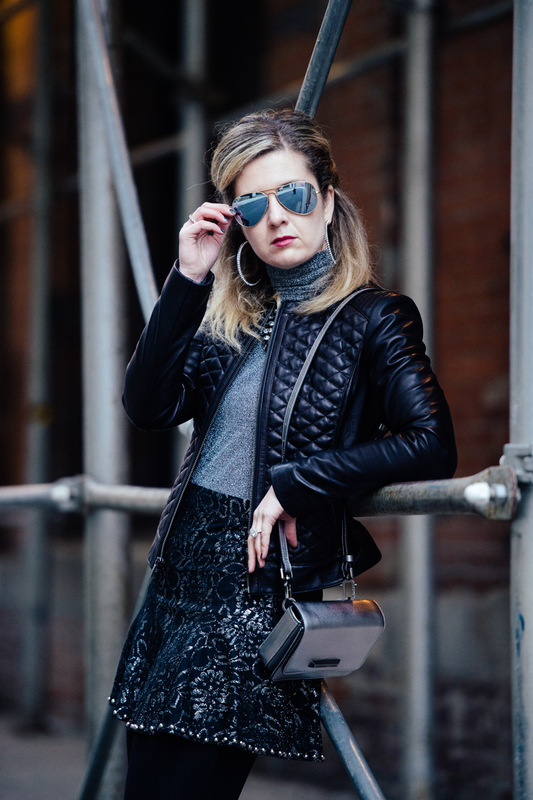 The weather was unseasonably warm, so I layered a brand new Cole Haan, quilted moto jacket, which created an edgy look. I work with the team that created the style, and they did an incredible job designing this piece. The leather is sleek, and the quilting adds a specialized design detail to the jacket, which sets it apart from the rest. It fits like a glove, and was the perfect piece to finish off the look. I added black opaque tights under the skirt, and tall platform boots to give me some height, as well as elongate my legs. 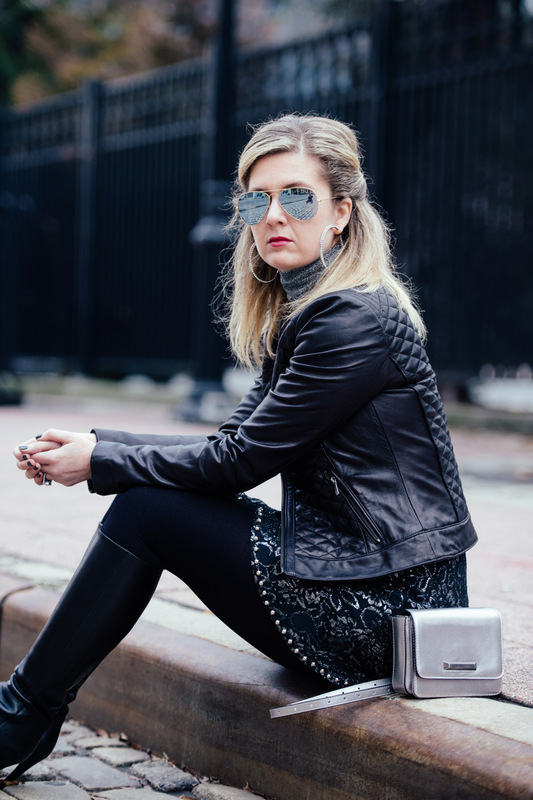 I accessorized with a gunmetal cross body bag by Kendall + Kylie. For jewelry, I wore silver hoop earrings (similar here), and a crystallized necklace (similar here). So, what styles are incorporated into this look? Any guesses? 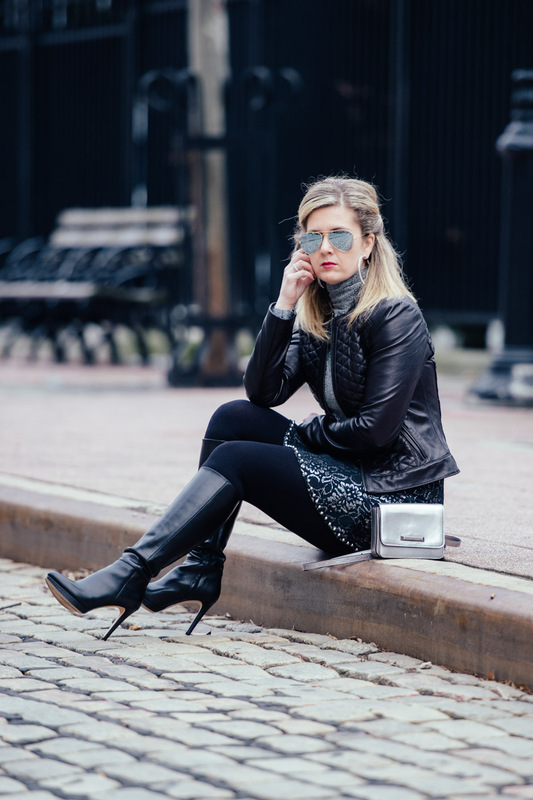 This look is a combination of feminine, because of the lace skirt, as well as edgy, with the leather jacket. So there you have it. You want to go for a head to toe, black look in the winter because it’s super simple? Think about elevating your style by including textures. There are so many to play with. You can add metallic accessories, leather, lace, crystal…you name it. Get creative, and you’d be surprised with the styles you can create.